TAMPA, Fla. — Russell Wilson’s childhood visions became a reality Monday as he reported to the New York Yankees’ spring training facility and donned the pinstripes for the first time. The Super Bowl-winning Seattle Seahawks quarterback will be spending the next five days with the Yankees after a trade last week that sent him from the Texas Rangers to New York. Perhaps the highlight of Wilson’s arrival came when Yankees batting practice Group 2 took center stage. 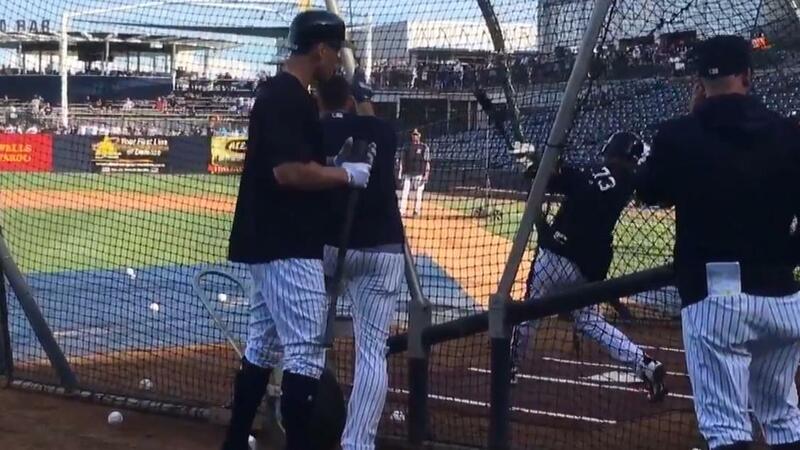 Wilson joined Yankees sluggers Giancarlo Stanton, Aaron Judge, Gary Sanchez and Greg Bird for a few rounds of live hitting. Unofficially, Stanton paced the group with 15 total home runs, while Judge had 10 and Bird had eight. Wilson got on the home run leaderboard, too, eclipsing Sanchez by one with six long balls. Although he took some soft toss over the weekend, Wilson, with his 31-ounce Louisville Slugger that had his name printed on it, said this was his first batting practice session in a while. Difficult or not, Wilson is enjoying being back around baseball. “It’s definitely one of the coolest things I’ve ever done,” Wilson said about putting on a Yankees jersey for the first time, with a nod to Babe Ruth. “I tried to get No. 3, but I think somebody had it already. Wilson’s late father, Harrison Wilson III, was a lifelong Yankees fan. Before he died in 2010 of complications related to diabetes, the elder Wilson hoped his multisport son might one day play for his favorite team. “I always told my dad I’d be a New York Yankee, and now I’m here,” Wilson said. Although Wilson is officially on the Yankees’ spring training roster, he won’t be playing in any games. Manager Aaron Boone has stressed that Wilson’s primary duty is simply to enjoy himself. Before stepping into the cage, Wilson fielded ground balls at second base. In addition to making routine throws to first, he also worked on his double-play pivots with shortstop Didi Gregorius. Wilson told Gregorius it was his first time taking ground balls in a year and a half. Despite the circus-like atmosphere that Wilson’s arrival at Steinbrenner Field has created, he told reporters in a news conference that his appearance here was sincere. Although he wants his players to pick Wilson’s brain about leadership, Boone has kept his charges to Wilson simple. Yankees like Oregon-born Seahawks fan Brandon Drury are ready to see how this week unfolds. Wilson, who played college baseball at NC State, was drafted in the fourth round of the 2010 MLB draft by the Colorado Rockies. The Rangers acquired him from Colorado in 2013. Wilson spent parts of two seasons playing Class A ball in the Rockies organization before he was selected in the third round of the 2012 NFL draft by Seattle. ESPN’s Jenna Laine and Jon Scher contributed to this report.